November 12, 2018 October 21, 2018 by Beau H.
The exceptional shirt jacket you can layer with just about anythign this season. Not familiar with Buffalo Jackson yet? Or the very specific brand of men’s style essentials they produce? We’re about to change all of that today on your favorite neighborhood menswear blog. Yes indeed, the Shepherd Moleskin Shirt Jacket from Buffalo Jackson could just be your new go-to fall and winter weekend layer — it’s that great. For just $70, you get a shirt-jacket that blends comfort, style, rugged appeal and that distinctive blend of Southern style and Western charm that Buffalo Jackson does so well. It’s the same type of cotton that outdoorsmen have worn and looked to for dependable performance for decades, so you can rest assured that you’re covered there. As known for its leather goods as for its equally well-crafted apparel, the Shepherd Moleskin Shirt Jacket gets the job done, doubling as a mid-layer (perhaps underneath a well-tailored topcoat?) or a top layer in its own right — the Shepherd Moleskin Shirt Jacket certainly would work swimmingly atop a classic chambray shirt, along with rugged dark blue denim, for a chilly early weekend morning. And if you fancy using the Shepherd Moleskin Shirt Jacket in place of a blazer atop an Oxford shirt, you can absolutely style it in that regard, too. The Wheat color in particular is a personal favorite, just as suited for wearing with the Flint and Tinder Stonewashed Jeans as it is with olive chinos and rugged brown leather boots. Front flap chest pockets add visual interest and functionality — feel free to use ’em to store your everday carry with ease. At the end of the day, there’s perhaps not a better, more rugged layer — atop a henley, underneath a camel topcoat, and so on — than this stylish shirt jacket. How will you be styling the Shepherd Moleskin Shirt Jacket this season? Let me know on Twitter. November 6, 2018 October 17, 2018 by Beau H.
We’re back at it today on The Style Guide with a new dose of men’s style essentials for you — I have a feeling you’re going to enjoy this #OOTD if you enjoy rugged layers. The centerpiece of this outfit comes, of course, from a Style Guide favorite — it’s the Taylor Stitch Maritime Shirt Jacket, and if you’re going to invest in a shirt jacket, now is the time to do it. The shirt jacket can be worn in plenty of style situations, including in inclement weather. It’s a reliable replacement for a bulky jacket, and it teams with other shirts already in your closet — as you’ll see below. In my mind, this is an #OOTD to wear on a chilly fall weekend out and about, or during a cabin weekend retreat … you get the picture. Heck, you could even reach for the Taylor Stitch Maritime Shirt Jacket at a late-season football tailgate or bonfire. Of course, if you have, y’know, actual work to do? Well then, it’s serviceable in that regard, too. So, here;s the deal: We’re going to layer up with a stylish casual shirt, then we’re going to throw on some rugged chore pants and some stylish leather boots, and then … well, you’ll be able to see the rest shortly. As I always stress here on the blog, if you start your outfit with one reliable centerpiece — a la the Taylor Stitch Maritime Shirt Jacket — the rest can easily fall into place. Lo and behold, here we are. You’ve got your rugged shirt jacket, you’ve got your tough chore pants … you’ve got one heck of an #OOTD. The Shirt Jacket: Taylor Stitch Maritime Shirt Jacket, $188 — We’re starting off this #OOTD the exact way we should — with the absolutely incredible Taylor Stitch Maritime Shirt Jacket. The (Other) Shirt: Flint and Tinder Check Buttondown, $108 — Can you layer a shirt … under another shirt? When it’s the handsome, casual Flint and Tinder Check Buttondown, of course you can. The Rugged Pants: Flint and Tinder Mill Pants, $108 — The great thing about layering a stylish casual shirt under something like the Taylor Stitch Maritime Shirt Jacket is that you can go a little more rugged or more classic with your pants — the Flint and Tinder Mill Pants are reasonably rugged. The Stylish Leather Boots: Nisolo Mateo Moc Toe Boots, $288 — That same adage applies to your boots — the durable moc toe construction and versatile profile of the Nisolo Mateo Boots in particular. The Socks: American Trench Merino Activity Socks with Silver, $19.50 — If you follow the blog, you surely know that American Trench makes some of the best men’s socks in the game. And that’s why they get the nod here. The Belt: Dango Products CNC-Machined Belt, $79 — The theme of this #menswear ensemble seems to be durable, dependable gear, and this leather belt is surely one of the best leather belts out there. 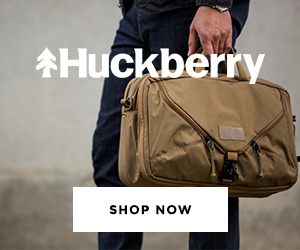 The Watch: Huckberry x Lum-Tec Combat B-42 Watch, $499 — Not yet acquainted with the dependability of the Huckberry x Lum-Tec series of watches? Change that right now, will ya? The Everyday Carry: Bespoke Post Light Up EDC Kit, $89 — Whether the day calls for an upstate hike or a swing through your favorite brewery, this kit from Bespoke Post is handy and helpful in the way of everyday carry essentials. I’d say there’s a lot to love about the reliability and extraordinary style of this #OOTD, correct? Maybe it’s just me, but you really can’t go wrong with the remarkable Taylor Stitch Maritime Shirt Jacket, and then the rest of your ensemble follows from there. Whether you make this work during a chilly fall morning or your first winter retreat, the other complementary pieces of this ensemble are every bit as excellent as you’d expect. The Flint and Tinder Check Buttondown gives you some visual interest — wear it on its own every chance you get, too. And for days where the job calls for real work — or a few rounds of your favorite beer — the Flint and Tinder Mill Pants are a solid choice, the ideal choice to sit atop the Nisolo Mateo Boots, which blend rugged style and refined durability in one package. They’ll be all the more comfortable and warm when you team them with cozy, surprisingly stylish socks from American Trench.Lastly, I’d urge you to never — nope, never — leave the house without a rugged, durable watch like the one shown here from Huckberry x Lum-Tec. And lastly, you don’t know the gear you need until you don’t know it — that’s where the Bespoke Post Light Up EDC Kit comes in handy. With that, this #OOTD is in the books. How are you wearing it? Let me know on Twitter. November 2, 2018 November 2, 2018 by Beau H.
You see the Flint and Tinder Mill Pants pictured aobve? To me, they’re a fall style essential — and the ideal way to kick off today’s Friday Read. They’ll work for a brewery visit — or brewing your own beer. They’ll work for a day hike. They’ll work for an impromptu weekend coffee date. They’ll work anywhere you do, mostly. Who’s with me? And wh’ else is ready for the weekend? We’ve kept busy as of late on the blog, telling you all about the best new field watch to pick up for the season, while also keeping you updated on all the men’s style picks your wardrobe deserves. And if you’re anything like me, you’re likely very excited that the weather is taking a turn toward fall. For me, that means plenty of time spent in Prospect Park and enjoying rich fall beers at places like the excellent Greenpoint Beer & Ale. How about you? It’s not all fun and games, though. As a matter of fact, by the time you check back on Monday (after you read tomorrow’s Style Pick of the Week, of course), we’ll have a new look on the blog — new fonts, a new design and layout, the whole nine yards. Or at least, we’ll give it a shot. And here’s where you come in: However you feel about the new look (is it better or worse? Cool or lame!? ), I’d urge you to please let me know on Twitter or via The Style Guide Facebook group. It’s a change I haven’t taken lightly — after all, it’s my name on the blog! And you and I both (likely) love the current layout. But change is afoot. So, please let me know once we get those changes rolling! And in the meantime, you can peruse the below Friday Read … and then come back for the Style Pick of the Week. Cheers! OK, so in the way of excellent live music, I’ve truly been floored by the passion and talent of Maggie Rogers, New York City’s own. She recently released a new music video, and you’d do well to check it out — and perhaps think about the state of pop music — via Consequence of Sound. If you keep up with my work on The Manual, perhaps you saw this piece on Mott & Bow and the brand’s new cashmere sweaters — they’re crisp, minimal and easy to pair with stylish M&B denim. Just in time for fall, too. And on to more menswear — I always try to do the best I can when it comes to rounding up fall style essentials, and if you’re still in search of a few picks to round out your wardrobe, I’d urge you to click on that hyperlink right there. Speaking of menswear essentials, there’s still time to add some stylish fall sneakers to your wardrobe — you’d do well to make that move right now with the New Balance x Todd Snyder Pale Ale 990V3, which I covered for GearMoose. A word of wisdom: These sneakers would wear well with the Flint and Tinder Stonewashed Jeans or the Flint and Tinder Mill Pants as seen above. Pair them up with a real pale ale on a chilly fall night for some seasonally friendly flavor … and style. That’s going to wrap up this week’s edition of The Friday Read — again, stay posted for the best new menswear of the week tomorrow, and then hold onto your horses for a whole new edition of The Style Guide very soon. Thanks for reading! September 28, 2018 April 19, 2019 by Beau H.
So, we’re doing things a little differently to start the Friday Read — or this edition, at least. You’ll notice the exceptional Danner Mountain Pass Boots featured up top (and down below) to kick things off. They’re a great pair of adventure-ready boots to get your fall weekend started — but that’s just my two cents. For future editions of our weekly recap, you might see a tasty craft beer or a great vinyl record featured, or perhaps a photo from a worthy long read at a Style Guide-approved site like Esquire. Either way, just something to get the gears turning to end the week. What’s on your weekend agenda? For me, it’s a pretty packed one. Coming off the absolutely amazing Audiotree Music Festival, it’s time yet again for another festival — on a slightly different scale. My favorite band and my heroes, Cincy-bred indie rockers The National, are hosting a very special two-day festival at the iconic Forest Hills Stadium! Titled “There’s No Leaving New York” — a fitting adage for a global band that came up in Brooklyn — the weekend is set to feature two headlining sets by The National (whoop! ), plus performances by indie luminaries like Future Islands (whom I saw in Portland last year! ), plus Cat Power, Phoebe Bridgers and Jason Isbell and the 400 Unit, for starters. Talk about an action-packed two days, right? In the midst of all of that, I’m aiming to hit up the nearby Finback Brewery, and take care of some writing and blogging in the meantime. Hopefully, your weekend includes some tasty coffee, some excellent craft beer, some terrific music and perhaps, some shopping for men’s style essentials. Without any further chit-chat, onward through the Friday Read! September 15, 2018 August 30, 2018 by Beau H.
Your new favorite fall shirt, courtesy of Proof. There’s no wrong way to slice it: Proof makes dependable, tough and versatile menswear for the guy on the go (that’d be you). Strong men’s style essentials, if you will. Case in point: The Proof Strong Shirt, a ready-made weekend style move that works and works. I’m also a fan of the versatility and mobility of the Proof Performance Oxford, and it looks to me like this dependable everyday shirt fits much the same mold. Fall calls for gear that moves with you and is ready for anything — reliable staples that work for morning coffee, afternoon brunch and an evening of brewery hopping. The Proof Strong Shirt does all of that and more. As Proof puts it, the Strong Shirt blends the everyday style of a classic chambray shirt with durable cotton and nylon for flexibility and ease of movement. That’s unique among chambray shirts on the market. That’s not all, though — the chambray itself comes from the Proof arsenal of exceptional fabrics: We’re talking cordura chambray from a leading Japanese denim mill. In short, that means the Strong Shirt is surprisingly durable and abrasion-resistant, the perfect chambray shirt for layering this fall atop your favorite henley and classic dark denim. The rugged shirt you need for fall weekend adventures. It’s also got plenty going for it when it comes to plain old classic style, too. The look and feel of the Proof Strong Shirt is very similar to that of your favorite standby, a J. Crew chambray shirt. From the front button pockets to the pleasing indigo chambray color, it’s a winner all around. In short, it’s a new modern classic, a shirt that can be worn with everything from tan chinos and white high-top sneakers to a classic navy blazer, dark denim and rugged suede chukka boots for a casual fall Friday. Plus, you’ve got that extra bit of versatility thrown in, thanks to the durable fabrication of the Proof Strong Shirt. Seriously, don’t hesitate to layer this thing atop a warm thermal shirt for your next day hike — it can handle it (On that note: You should learn how to dress for your next camping trip before it’s too late). Conversely, the remarkable Proof Strong Shirt is going to team just as readily with a coated waxed cotton jacket and your favorite pair of broken-in denim for a fall football tailgate or a bar crawl — that’s versatility at its finest. All of which is to say: Stop reading this story and go get the Proof Strong Shirt right now. September 14, 2018 April 19, 2019 by Beau H.
Does it feel strange to be barreling through September and looking toward (gulp) October? It seems to me like it was just yesterday we were talking about the best menswear to close out summer, doesn’t it? At any rate, we’re well and truly in full-on fall prep mode. I’ve got a couple exciting early fall men’s style features in the works for GearMoose and The Manual for which I’m really PUMPED about (yes, PUMPED). More on that soon. And in the meantime, I’m very much looking forward to taking an evening flight back to Pure Michigan, with a relaxing weekend on tap, one no doubt fueled by iced coffee and perhaps a trip to the new Founders Brewing Detroit Taproom — what about you? If you need to shop for fall style essentials, this blog has you covered. If you simply want to find your new favorite pair of denim, again, your trusty friends at The Style Guide are here to help. And if you’re just looking for something to read or peruse? Again, check out the latest Friday Read. Thanks for being along for the ride! I’ve written often about the stylish, essential menswear being made by my San Francisco-based buddies at Taylor Stitch. That’s certainly the case with the Triblend Tee in Grey, an easy base layer for fall when paired with everything from a classic chambray shirt to a denim trucker jacket. To learn more, you should head to my latest GearMoose post. Early fall is all about making your favorite pieces of menswear work for you — thus, this #OOTD covering how to layer for fall. We could all use a bit of a refresher every now and then going into a new season, but I know this — if you start from the ground up with rugged boots like the Red Wing Iron Ranger, you’ll be in good shape. Ya dig? My buddies at The Manual always keep things sharp and in line when it comes to your everyday carry essentials — and their post on the best men’s wallets is no different. Keeping your cards handy no matter what will only help you this fall — trust me on that. Last but not least, here’s a bit of music news for you — if you haven’t yet checked out the emotive, powerful indie rock being put out by Lindsey Jordan in Snail Mail, well, here’s my recommendation. Simply put, Snail Mail’s debut album, “Lush,” is just excellent. In fact, you can hear it coming to a venue near you soon — Snail Mail just extended their tour recently. Get on board, plug in and rock out. And that, ladies and gentlemen, brings us to the conclusion of another Friday Read. You can be sure we’re gearing up for a great weekend — and a great Style Pick of the Week tomorrow, no less. Still in need of something to read? This #OOTD shows you how to wear a chambray shirt. Heading to a weekend rock concert? Dress like this. OK, folks — that’s all I’ve got. Cheers! August 31, 2018 April 19, 2019 by Beau H.
Can you hear that? That’s the sound of summer rushing by, on into early fall. It’s hard to believe, to say the least! We’ve already started looking ahead to transitional style essentials to get you ready for fall, but I’m taking the time this weekend to reflect on an amazing summer in Brooklyn and elsewhere. For now, I’m actually heading back to Michigan as we speak for a lovely and long Labor Day weekend, with some of my favorite men’s gear picks in tow (naturally). What are your plans for the weekend? Hopefully, they involve some relaxation, some rest, a craft beer or two, and lots of laughter & love with family and friends. If you choose to spend a bit of your time this weekend reading the pages of this site, I sure do appreciate it. Cheers! Cult favorite brand Stefan Grant just launched its largest collection yet — it’s called “Know Your Lines,” and every bit (design, production, even the photo shoot) was done in the lovely city of Los Angeles. We’re talking easy-to-layer staples like lightweight bomber jackets & modern trench coats, perfect to show off some edgy style this fall. The best part? The brand is offering 20 percent off for Labor Day weekend. New menswear and gear that’s on sale? Sounds good to me. In the way of other Labor Day sales, you can also get 20 percent off all Sunski sunglasses (as seen on my Instagram) now through September 3rd! I love my pair, and you’d do well to hop on this train — polarized lenses and a lifetime warranty sound good to me! State Bicycles also has you covered when it comes to functional, sharp cycling gear — you can get 25 -80 percent off sitewide, and if you’re buying a bicycle, use the code “ROLLUP” to get a free rolltop backpack. Perfect. I’ve long been a fan of the stylish casual watches that come out of the ongoing Timex x Todd Snyder partnership, so I certainly wasn’t surprised to see another excellent leather watch recently debuted by the two iconic American brands: The Timex x Todd Snyder Beekman Watch. I recently took a deep dive (not literally!) with this watch for GearMoose, and I’ve also been featuring it on my Instagram. In short: You owe it to yourself to pick up this timepiece. It’s still pretty darn relevant to talk about how to transition into fall, if you ask me. That being said, I’d advise you to revisit (or visit for the first time!) this #OOTD on how to wear a chambray shirt this fall. Hint: It involves the Taylor Stitch Everyday Chambray Shirt. Let’s close out today with another recommended gear purchase to get you ready for changing seasons. Granted, you won’t be able to get the Ball and Buck Active Anorak until spring 2019, but you’d do well to pre-fund this excellent jacket right now, because it’s packed with functionality and easygoing style. I had the chance to test it out around Brooklyn recently (see more on my Instagram) and can certainly vouch for it. Get to it! OK, my friends. That’s it for today. Still looking for more men’s style reading? Read on to find out about some of the best men’s jeans to buy now. Then, check out the rugged long-sleeve henley to pick up for fall. Last but not least — check out the best men’s gear to upgrade your wardrobe before it’s too cold (and too late!). Thanks for reading!